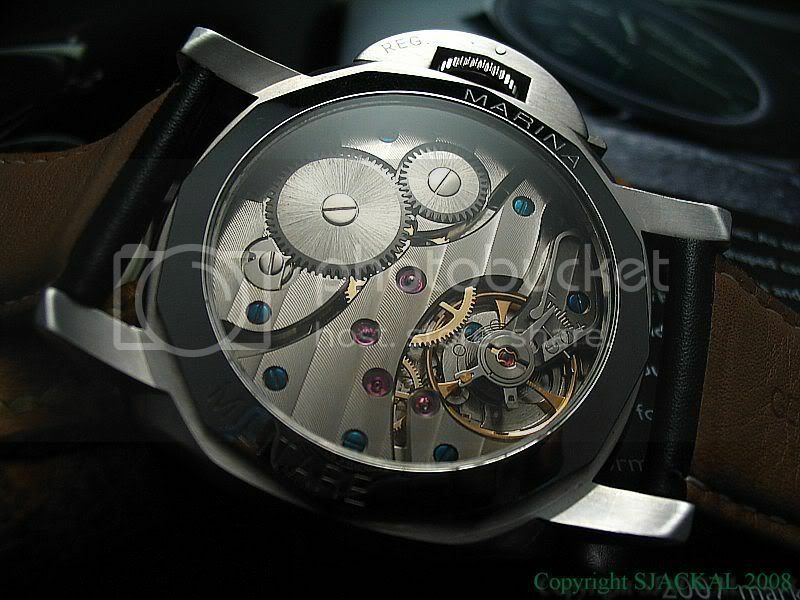 I just ordered a custom from Chris (RAY KNIGHT on WUS), unbranded, 44mm, sandwich dial with seconds dial, black hands, ceramic black PVD coating, doomed AR coated front sapphire crystal, sapphire crystal caseback, decorated soprod ETA 6497 swiss movement ($395) (rhodium plated and modified with CTG bridges, pearlage on base plates, polished gear set, flame blued screws) and a rubber and a leather strap. 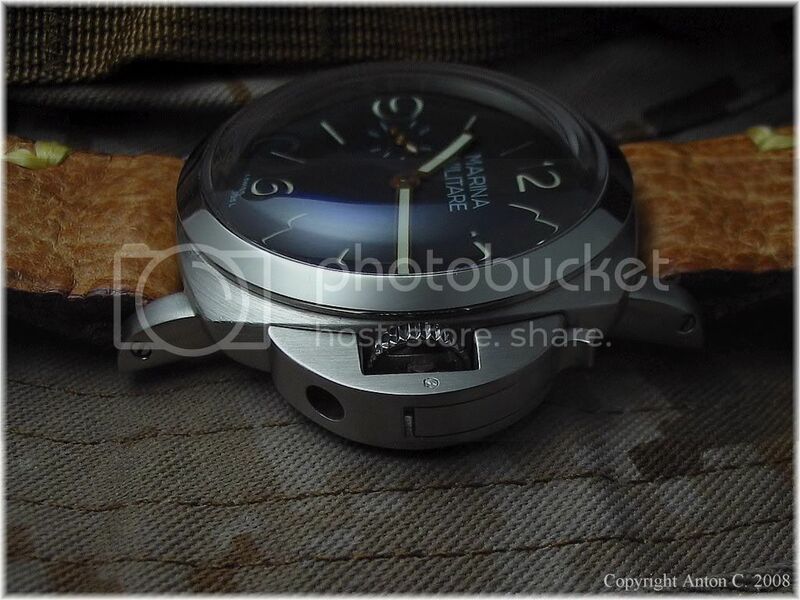 We're waiting on the black ceramic PVD case and buckle (2 to 3 weeks). He is working on the movement (tuned in 6 positions to within +/- 3 seconds/day), the Tritec Orange color markers and the C3 yellow/green lum. This costs more than twice the cost of a Davidsen, but I thought it was worth it and exactly what I wanted. Chris is very easy to talk to and will do what it takes to please you. See his work on WUS. Hey Rick, thanx a lot for this info. Its always good to know more alternatives! I appreciate it very much. A decorated movement is great! Those Ebay pseudo decorated Chinese movements just cannot compare, the blued screws actually turn rusty on mine! I had to resort to blue marker pens to touch them up. Yours sounds like some kickass specs! I like the Red 12 straps anh Zack is about 50 miles away. I plan on going down and seeing him about a strap for my watch. Another one to consider is Gregs straps. 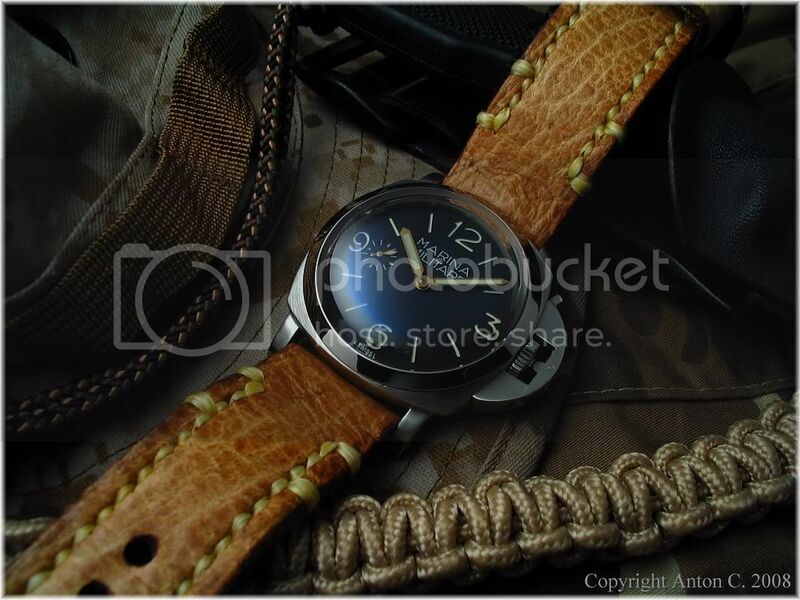 I like his Crazy Horse II with a pvd buckle. Oh I love the strap Zack made for me. It looks rough and tough but its actually the softest strap I have! And Zack treated it specially with additives to deal with the hot and humid south east Asia weather. Cool! I just received email from Davidsen that he sent my glass back! I received the glass back from Davidsen. Looks great, will post a pic update later. This 47mm MM is a fantastic looking watch & perfectly matched to the RED12 strap. Both Davidsen & Old School (Zack) are gifted craftsmen. Thanks for taking the time to put this blog together & posting great pics Anton. 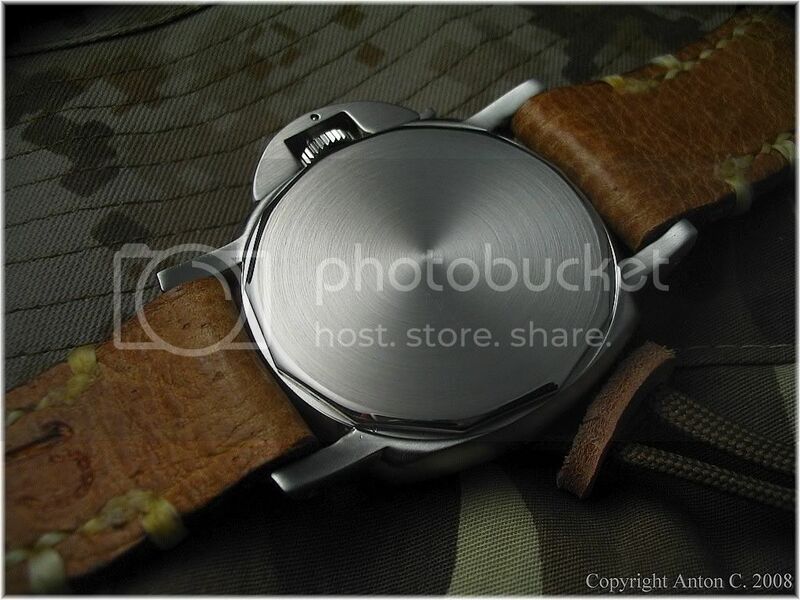 Looking forward to seeing pics of the MM with the see through caseback. Thanx Rick for the information. that my see though case back been made Water reisit structure too. impressed with these pictures indeed. I am delighted to hear that you are happy with the watch i made for you.Hope to serve you soon. Great to have you here Davidsen! Thanx for making a nice watch and for your compliments. Will definitely contact you again if I want another Pamhom. 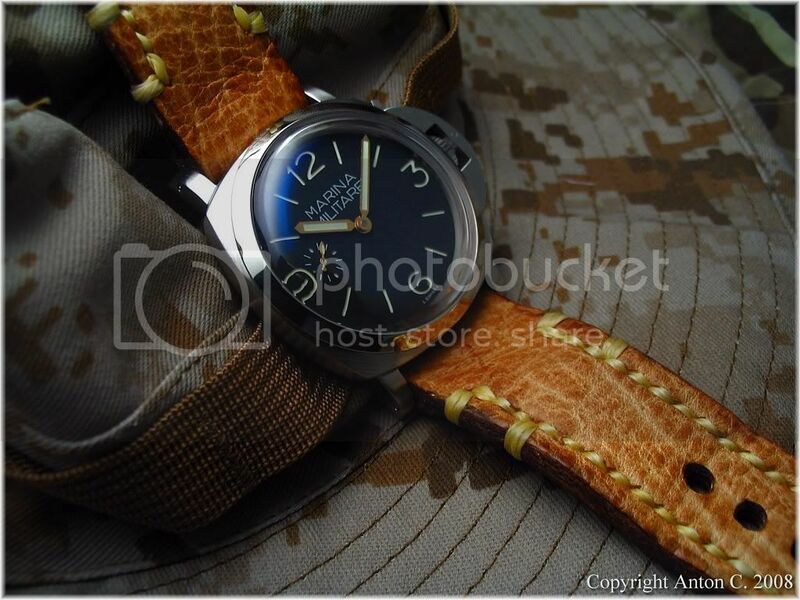 I'm a french fan of Marina Militare replica (tribute sounds better....). I' m interresting on those leader work like Ray Knight or Davidsen realization. 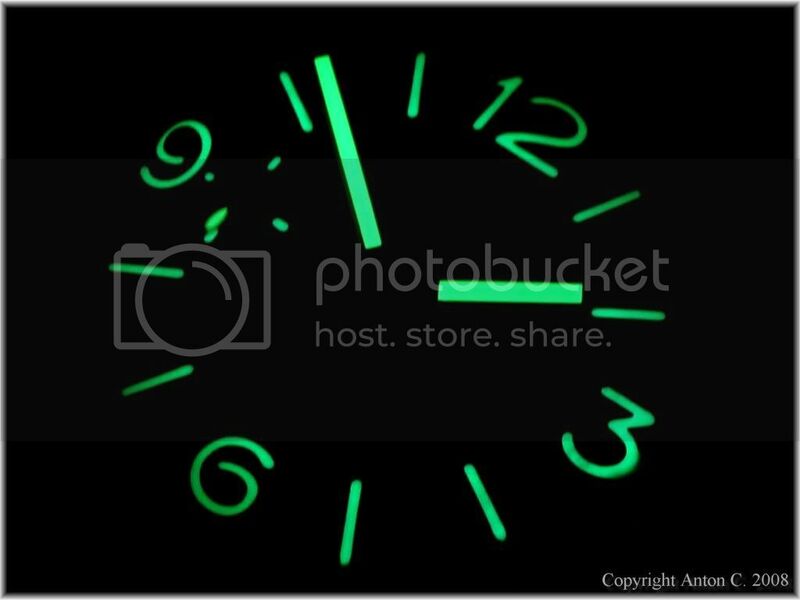 I order on chinese ebay model, but i'm a little deseapointed about lume dial/hand and precision movement. After reading your blog, and post on WUS, i 'm realy falling in love on Ray and Davidsen work, but i don't know how to contact them. Apologise for this sterile post. 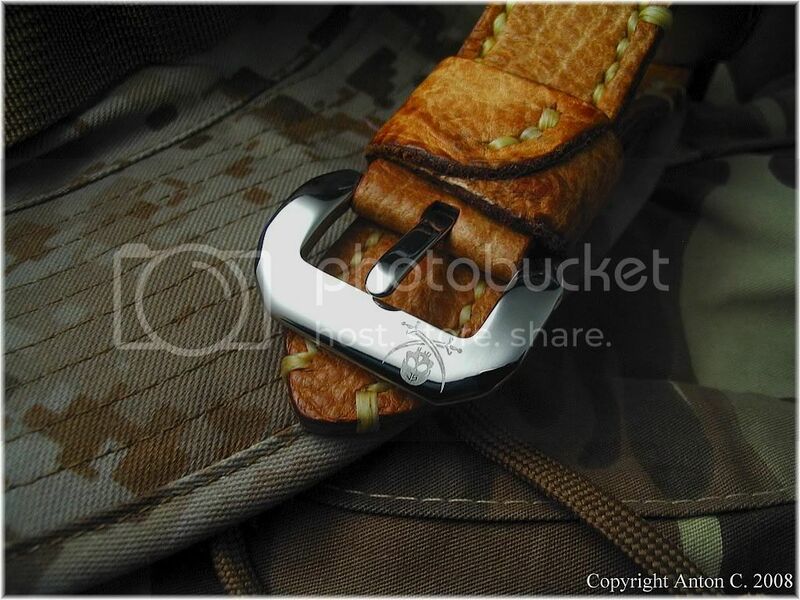 what dimensions are the straps? 24mm ? 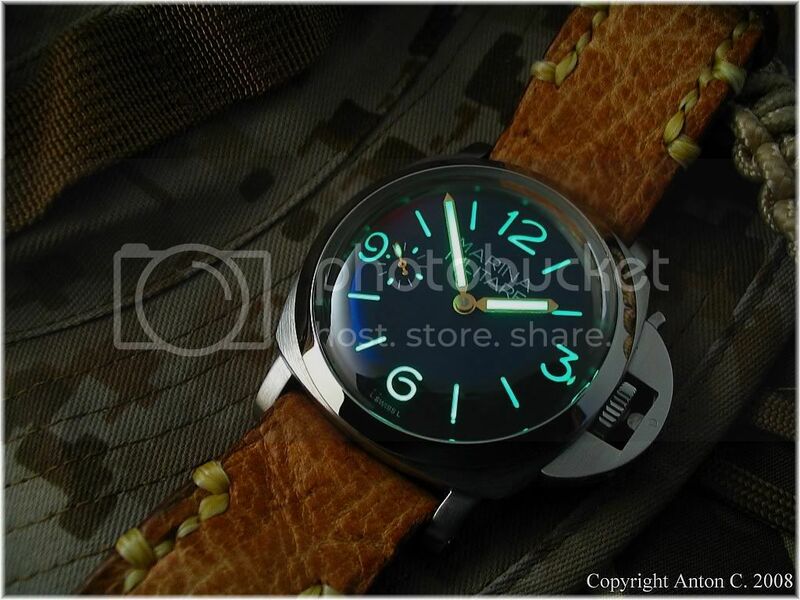 Bro, How is the build of this watch? Is the crown lever tight? I'm very interested in getting a davidsen MM but would like to have more feedbacks on the build from past customers..
That is quite possibly the sexiest Custom Pan homage I've seen. 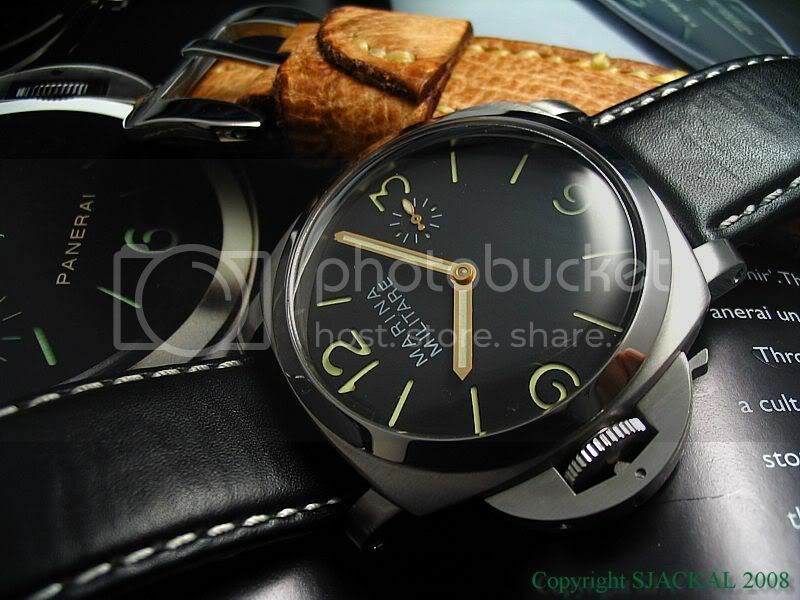 Everything about it is perfect, from the sterile dial, gold hands, strap color, stitching, etc. The Skull and crossed swords is the finishing touch on a truly one of a kind timepiece. Cheers to you Anton C.
Watch fan from the "Evil Empire" that is the United States. 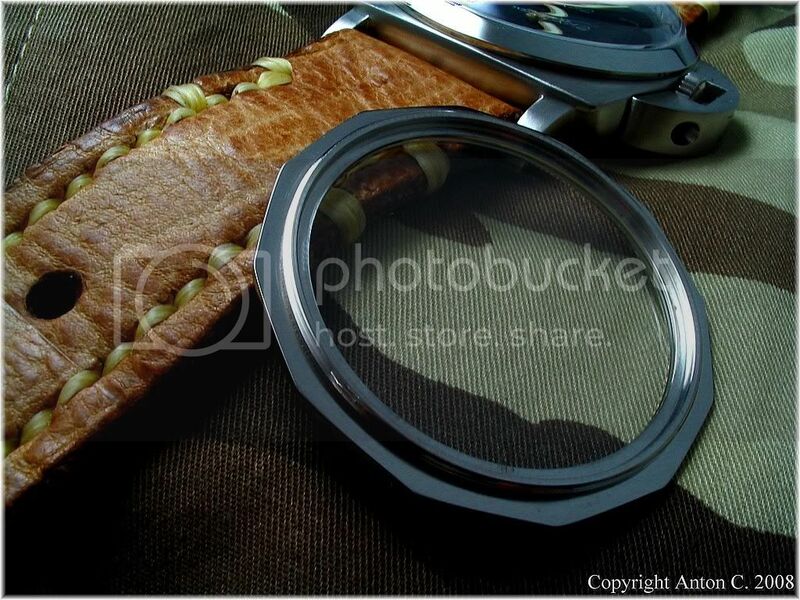 The pictures look fantastic... Do you mind detailing more about the quality of the watch ? How is the waterproofing holding up ? Does the steel tarnish rapidly etc ... ? Can Anton or someone else pls provide his email? I've left him a message at this blog, but he has yet to contact me. Thanx. Thats the email of Davidsen I had too. I am afraid I don't have any other. No worries, Anton. How is your homage from Davidsen - is it still running well? I got a quote of $550 from JOA (Jorell), hoping Davidsen will contact me soon. I think its a heresy to use a glass case back with a Luminor.... but I see no such issue with a Radiomir. ho. just wondering if the watch mm you bought here from davisen in 2008 is still working to this day(2010)?